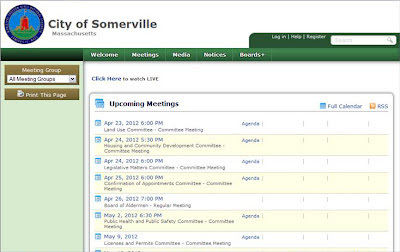 The City's Meeting Portal, an online listing of meeting information, videos, and minutes seems to have received an update recently. The now sleeker interface is easier to navigate and puts the most recent meetings at the top. The columns next to the meeting descriptions house the agenda, minutes and videos separated by a column each. I hope this gets changed or that the columns get headers describing what you can find in them. For Aldermen attendance records, check out the Boards+ tab and click on their names. Or, you can check out Ward 5 Online as I go through the attendance record for the Board's mid-year review sometime in June. The meeting portal was launched a couple of years ago and is necessary for compliance with the Open Meeting Law. Please note that meetings can still be cancelled the day of and agendas have to be posted 48 hours before a meeting with weekends and holidays not included. For example, Thursday's Board of Aldermen meeting agenda is posted by 7pm on Tuesday night. Members can still submit in orders post-publication of the agenda, but they are added as supplemental items. I began using the meeting portal as my main source of information when it was launched and have linked legislative items to this website for readers to see the journey of their concerns go through the Board of Aldermen subcommittees. I began doing this in 2010 and it has become one of the most complimented aspects of my website. Thank you! The portal is not only a great resource to search legislative items and view videos of meetings, but it's also important to see if your elected official is worth your vote and tax payers' money based on their attendance percentage at meetings. There's nothing worse than paying someone to do a job and then finding out they're not going to work when they're supposed to. The meeting portal is open to everyone, but one needs to create an account in order to comment on legislative items. All documents are downloadable in PDF or Word format (both are used). A Microsoft program is needed to view the videos, but there is an automatic download option for that.